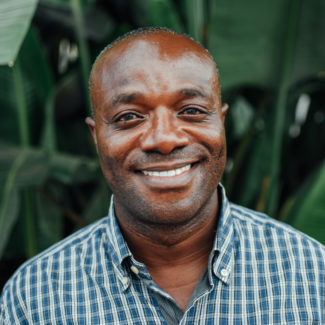 Urbain Ngobobo is the Director of the Fossey Fund’s Congo programs. Since he joined the Fossey Fund in 2011, Ngobobo has set up two new Grauer’s gorilla research and protection sites in eastern Congo, in Nkuba and at Kahuzi-Biega National Park. Ngobobo’s expertise is the research and development of policies and strategies to protect Grauer’s gorillas and their habitat, in partnership with local communities and authorities. Ngobobo holds a master’s degree in innovation and development. Before joining the Fossey Fund, he worked with the Zoological Society of London and with the Frankfurt Zoological Society and did field work in several Congolese protected areas, including Virunga, Maiko, Garamba and Upemba National Parks.